This "listen back" function is not new. Many wired intercoms used this same approach - using the speaker as a microphone. The "horn" is passive and functions as a simple dynamic microphone when in "listen back" mode. Switching from PA output to mic input is performed in the radio. Placing the preamplifier at the horn is unnecessary and creates new switching problems. In a PA the speaker is right next to the electronics which makes noise a non issue. Anyway, as I have said, I have not taken one of these guys apart so I am not going to fight over the issue I still believe it to be a better solution to have a pre-amp in the horn but it could very well add another 90 cents in parts and that could be considered a non-starter when a cheaper alternative is available. I still suggest to just try it out without actually installing things and let the result be your guide. How would the horn get power for its amplifier? You can easily send DC along the same conductors that you send the signal through! I still suggest to just try it out without actually installing things and let the result be your guide..
Best advice of the thread... a pragmatic means of determining how sensitive to noise pickup YOUR individual installation is, theory be damned. Virtually cost free, easy to accomplish, and definitive... what's not to like? 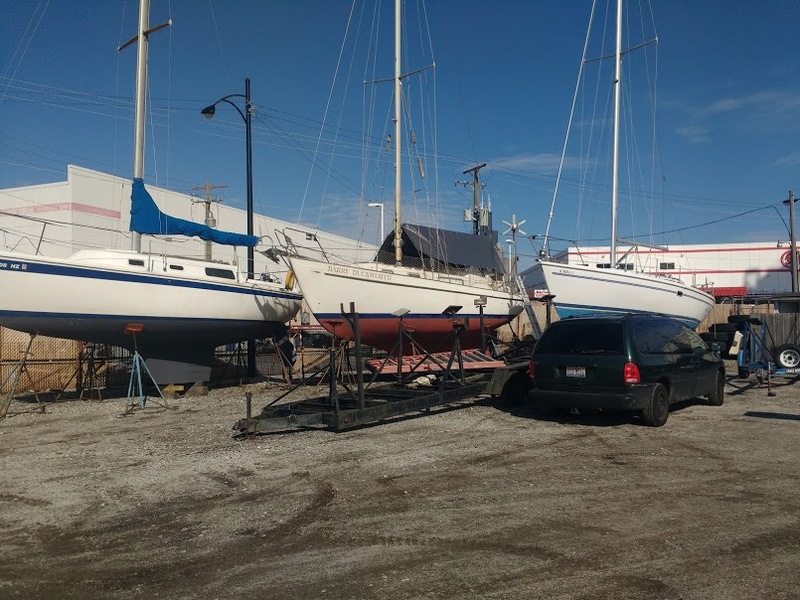 Since the boat is on the hard at the moment, the engine is winterized, and the temps are regularly dipping below freezing I think running it isn't really an option at the presently. I'm going to install the RG-213 coax and button up the radio installation for now. If, once we get BD back into the water and I don't like the performance of the loudhailer "talkback" feature I'll deal with it at that time. I apologize for going off topic, but I am in the market for a new VHF and would like one with an AIS receiver. I have looked at both the B&G V50 and Standard Horizon 2200. Both seem good, was there anything that swayed you towards the B&G. I think it is much easier to connect to the chart plotter than a SH since it has a NMEA 2000 line out. I have an Icom M304 that the last owner made errors while imputting the MMSI number. It must have been 2 errors because the "free reset" has been used up and it will no longer accept a new number. A couple of the digits are transposed so it can not be used for DCS calling and it will transmit the wrong MMSI number if the distress button is pressed. Also, i was having trouble interfacing with the NMEA-0183 even though I have a multiplexer. I contacted Icom and they wanted a minimum 1 hour of labor to reset the radio from one of their "approved factory repair stations" which is $98/hour plus Insured postage paid both ways = probably another $40+ so I wasn't going to mess around paying nearly $150 for basically the same radio I can buy new for $199. So I was in the market for a new radio that had NMEA-2K, and a remote mic. I will never EVER buy another Icom product so long as I live, so it had to be something else. I've got all B&G equipment so I looked at their VHF and liked their remote mics. We have an aft cabin with no pass-through belowdecks so keeping/charging the remote mic in the aft cabin lets us use it as an intercom when we are not underway and the cabins are occupied and buttoned up, and nobody is in the cockpit. I can even buy another mic as well if that was ever needed and use both at the same time as intercoms. The main VHF is in the main saloon at the nav desk. We have an Em-Trak Class B AIS transponder already, so we don't really need the AIS receiver on the VHF, but a backup doesn't hurt. I'm giving up on trying to use anything marine network related that isn't NMEA-2K so any radio I buy needed to be compatible and it is amazing how few radios on the market are 2k. 0183 is just junk and not worth the headaches. The V50 was a little more money than I wanted to spend, but looked like a decent piece of equipment that will last us 10 or so years and had all the bells and whistles I wanted. I've used Nmea 0183 for years, and the only thing I've had to do to get it to work is to set the baud rate correctly. But I agree that paying $150 for a VHF reset is too much. Normally you dont use coax or shielded wire for speaker wire, it draws down the signal thru induction. But I dont know about marine loud hailers.... if they are any different than most speakers. Since the horn (speaker) is used as a microphone, gotta use shielded wire. You can use shielded wire for speakers too without issues, but if small gauge is used the resistance can reduce the level a bit, depending upon how long the run is.